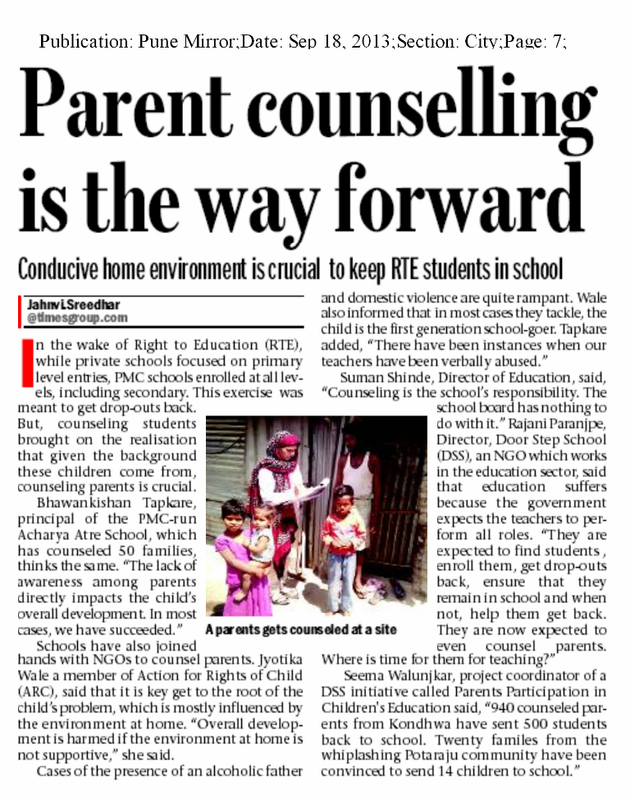 Conducive home environment is crucial to keep RTE students in school. In the wake of Right to Education (RTE), while private schools focused on primary level entries, PMC schools enrolled at all levels, including secondary. This exercise was meant to get drop-outs back. But, counseling students brought on the realisation that given the background these children come from, counseling parents is crucial. 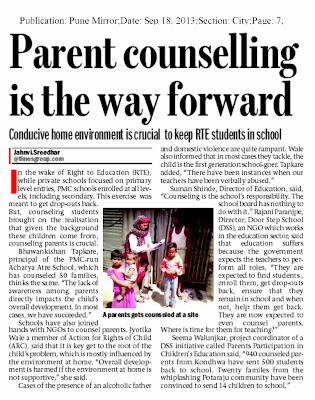 Schools have also joined hands with NGOs to counsel parents. Jyotika Wale a member of Action for Rights of Child (ARC), said that it is key get to the root of the child’s problem, which is mostly influenced by the environment at home. “Overall development is harmed if the environment at home is not supportive,” she said. Suman Shinde, Director of Education, said, “Counseling is the school’s responsibility. The school board has nothing to do with it.” Rajani Paranjpe, Director, Door Step School (DSS), an NGO which works in the education sector, said that education suffers because the government expects the teachers to perform all roles.